It’s hard to imagine that the 415-square-foot Old World kitchen was once a dining room, but a few years ago it was where the family gathered to eat their meals, not cook them. After living with their dining room addition for several years, the homeowners decided a room swap was in order to better utilize their space. 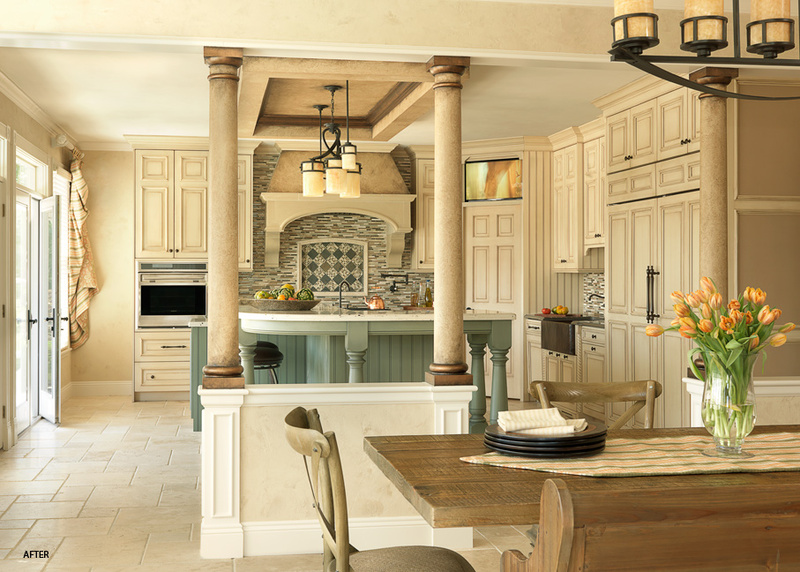 With the idea to flip the dining room and kitchen, they would create an open, connected space. “By tying the two rooms together, we have a more open area, which allows us to entertain more in this area,” say the homeowners. Enlisting the help of Jim Howard from Glen Alspaugh Kitchens & Baths, they set out to make the switch. Once a design was agreed upon and further refined, construction could begin. A former exterior bearing wall needed to maintain structural integrity was removed to open up the space. “To maintain the support the wall previously provided, five columns were built on half walls, which defined the two spaces while preserving the open view,” says Jim. With a blank slate, the Old World kitchen came to life. A large island became the basis for the rest of the design decisions. Large in size to provide plenty of space for preparing, seating and entertaining, the island is grounded by a soffit mirroring its size. 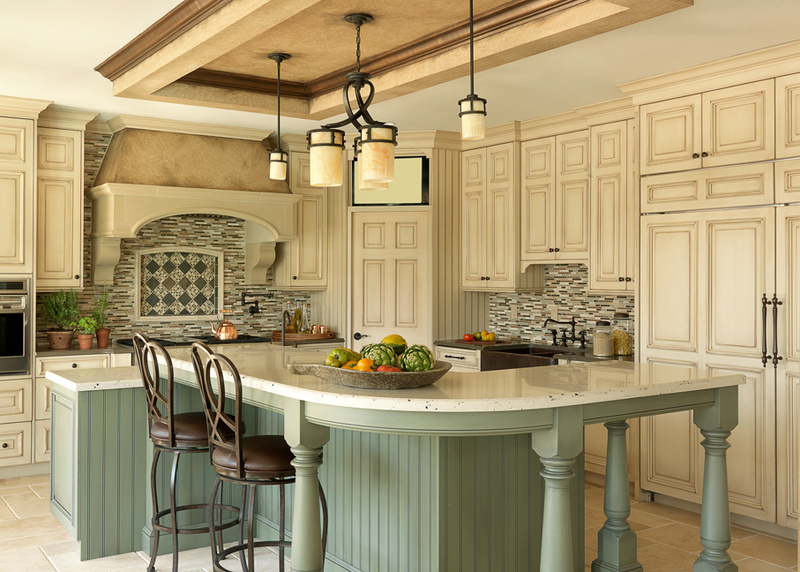 “With two L-shaped counters nested together, the island is a bit unusual in shape for a traditional kitchen,” says Jim. “It allowed for both a wrap-around prep counter and a seating area.” A round copper sink was installed at one corner of the island and provides easy access when working at the cooktop. 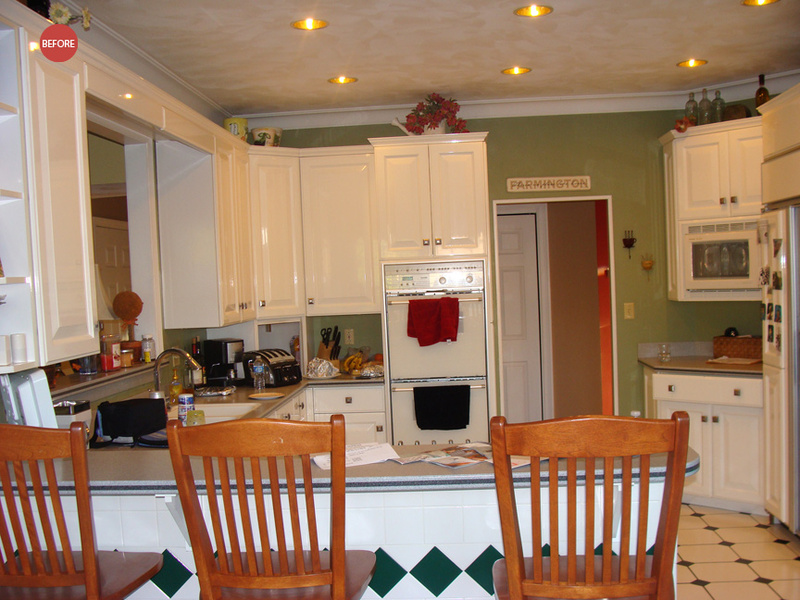 Entertaining is a breeze in the remodeled kitchen. Equipped with six feet of Sub Zero refrigeration, three Wolf ovens, microwave and warming drawers and an additional beverage center in the island, the homeowners are outfitted to host any gathering from a dinner party to a holiday feast. 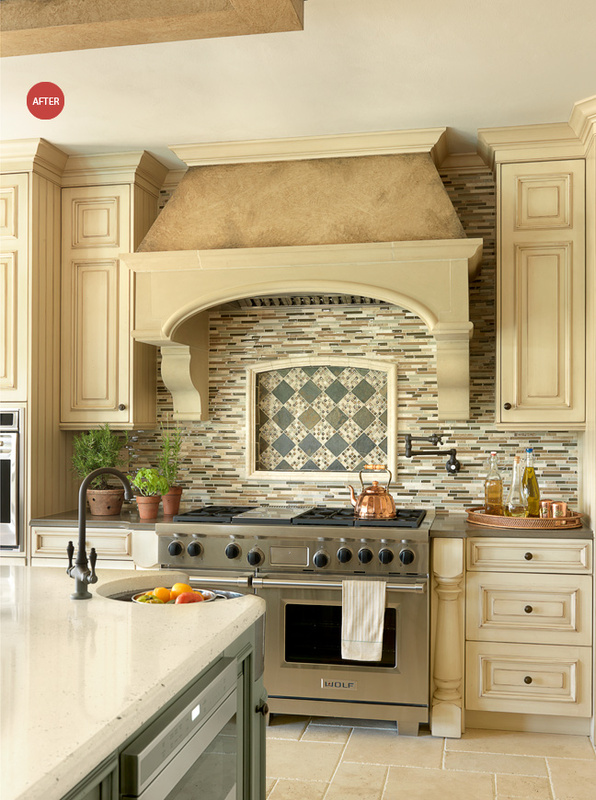 Soft earth tones and antique finishes give the kitchen a traditional look, while a modern mosaic glass tile backsplash adds a bit of contemporary. Mixing the styles effectively was a challenge interior designer Barbara Slavin faced. “It was challenging to combine the Old World look with the contemporary updated kitchen selections, such as the glass backsplash and the smooth concrete island countertop,” she says. 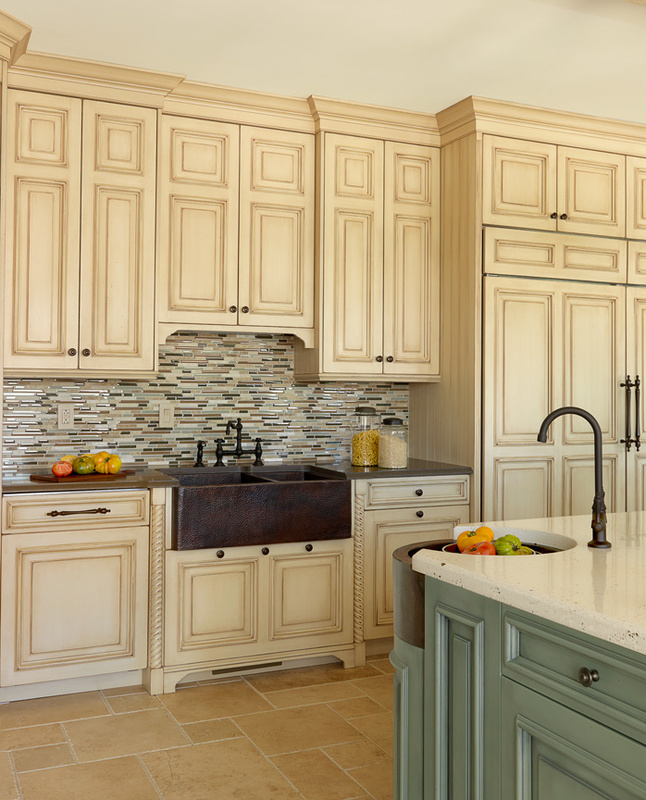 With a larger and more efficient kitchen, the homeowners couldn’t be more pleased with their decision to swap the spaces. The open flow is perfect for entertaining. 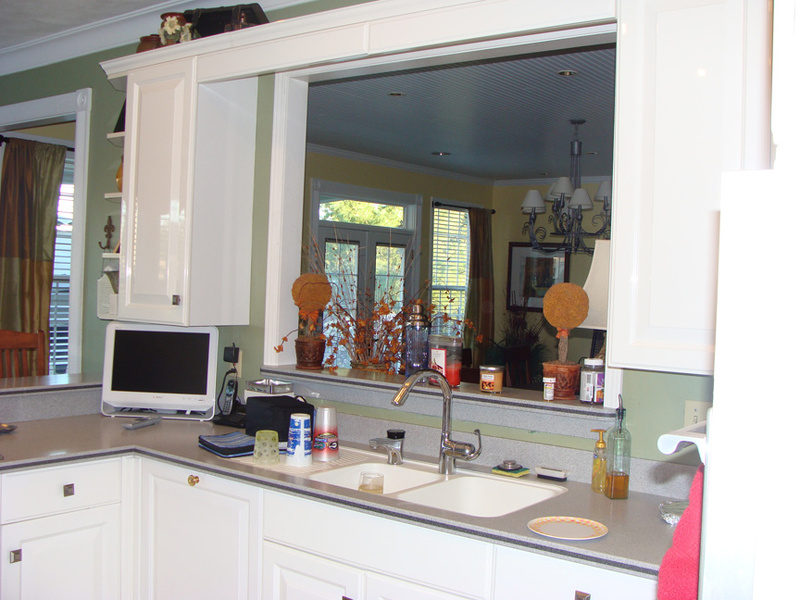 When walking in the front entry of the home after the completion of the project, Jim was surprised to have a diagonal view down the hall, into the new dining room, through the old kitchen, into the new kitchen and out the rear patio doors.